Food Costs > How Much Does a Bag of Apples Cost? How Much Does a Bag of Apples Cost? A bag of apples will often have about five pounds and will be sold at local apple orchards and grocery stores. The price of a bag of apples varies depending on the time of year, the variety, where you purchase it and the size of the bag. It can be as little as $1.25 per pound during the apple picking season and anywhere from $3 to $8 for a large bag of apples that weighs about five pounds. On Amazon.com, at the time of this publishing, a three-pound bag of Gala apples retailed for $11, with an additional $5 applied for shipping. At Costco, a five-pound bag of Royal Gala apples retails for about $8, while a five-pound bag of Honeycrisp apples retails for $11. 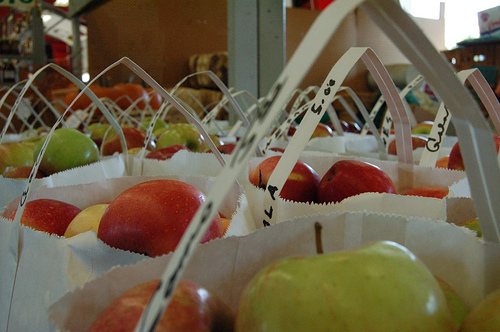 Common varieties often purchased in bulk includes Red Delicious, Granny Smith, Jazz, Honeycrisp, Golden Delicious, Fuji, Pink Lady, Ambrosia, Gala and Macoun. Most bags of apples, commonly found at a local grocery store, will often be around three to five pounds. Purchasing apples from the local orchards will always be a great way to try out new varieties because sellers often have slices from all the varieties for shoppers to taste. Owners of orchards can also offer suggestions with regards to what uses a particular apple variety is best suited for. Smell the apples up close for its freshness factor. A good apple will not have a musty smell, and a good apple, when examined up close, will be firm, shiny and smooth with intact stems. Red Delicious and Honeycrisp apples will not make great apples for pies. Red Delicious apples, also, are not recommended for applesauce or baking purposes. While most apples can freeze relatively well, the Gala variety has been known to be a poor choice for freezing purposes. As a general rule of thumb, one pound of apples will equate to four small apples, three medium apples or two large apples. The average apple, depending upon the nutrients it receives, can weigh about 0.33 pound on average. Try to buy your apples when in season. This is often during the early to late fall months. Be sure to check out your local apple orchards before buying at a grocery store. Not only will the apples be fresh here, the costs can be considerably less. The larger the bag is, the less you will pay per pound. CookingLight offers eight creative ways to use a bag of apples.